You know those days when nothing is going according to plan? When there are 400 chores to be done and more being created every moment and still nothing is going right? And that is 100% ok. Because the chores will always be there. There will always be laundry to be done or a shelf to be dusted, but today was my friends first 5k. And I wanted to be there to cheer them on. So, we dropped the chores and the work and drove down to be there to help them celebrate. I am so proud of them and can’t wait to see where they go from here! Totally worth ditching the chores. Then, just about the time I could get back to the swing of things an unexpected bbq popped up and it was a fantastic opportunity to catch up with some friends. I can stress about that pile of paper work later. 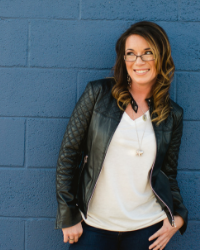 Right now is about letting go of the moments that are out of your control and enjoying the ones that matter. 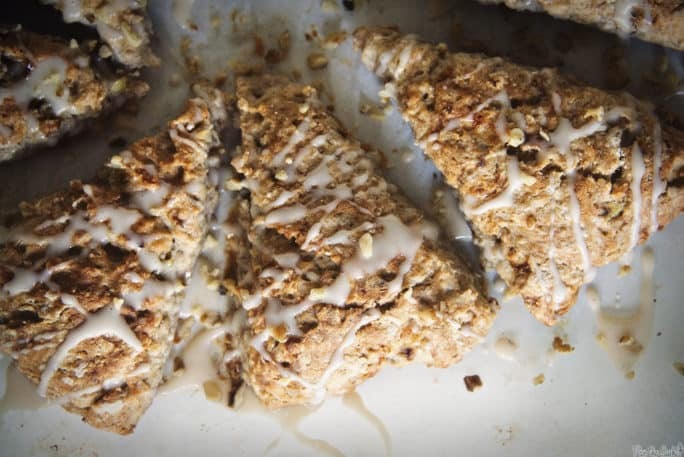 And, when you get back to those chores and find some past due bananas on the counter, these banana bread scones with maple glaze are perfect for savoring those moments. In a bowl, mash the bananas with a fork to equal one cup (and add a bit of milk if needed to fill to one cup, or some more banana if you have another about). Mix in the Greek yogurt; Set aside. In another large bowl, whisk the flour, sugar, baking powder, salt, and cinnamon. With your fingers, work the butter into the flour mix until it resembles fine crumbs and no large pieces remain. Stir in the banana mixture until just combined. Fold in the nuts. On a piece of wax paper, lightly dusted with flour, form the dough into a 9" disk about 1" thick. Top with a light sprinkle of flour and another sheet of wax paper. Place in freezer for 30 minutes. When ready to cook, remove the top piece of wax paper, slice the dough into 8 equal pieces and slides each out a bit to give each piece some room to grow as it bakes. Place the dough, still on the wax paper, onto a baking sheet. Bake 25 to 30 minutes, until scones are a light golden brown. Whisk the maple syrup, vanilla, and confectioners' sugar together to form the glaze. Add more sugar if needed to thicken. Drizzle over the scones. 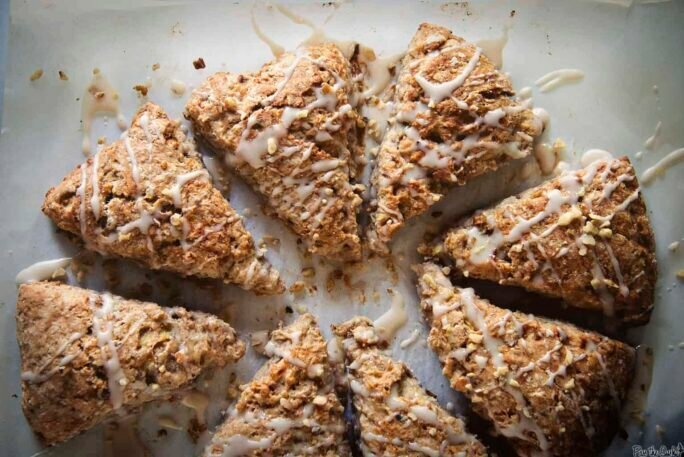 this looks so gooood..im a big banana bread person so yes to these lovely scones. Mmm, I’ve been craving scones for weeks. I need these. Chores will always be there! 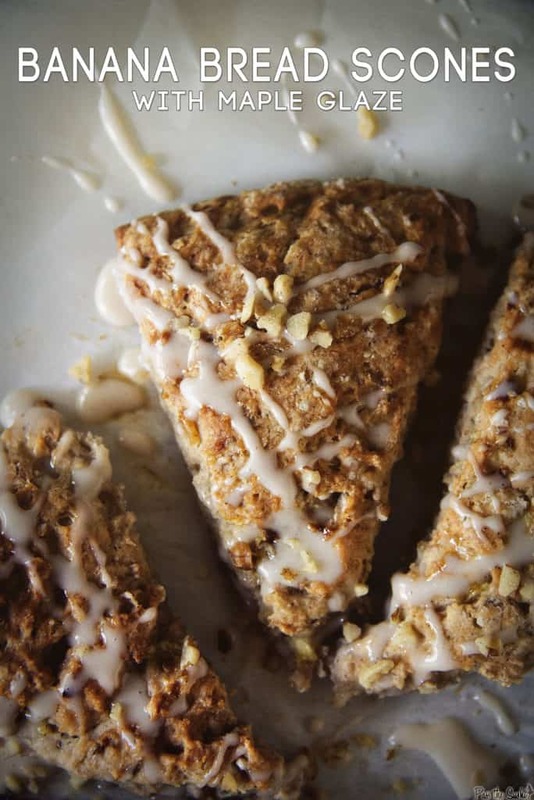 I should know – I have a pile of dishes in the sink right now, but feel pressed to get caught up on my reader subscriptions instead of doing dishes 🙂 Love the scones – I always make banana muffins or banana bread with my over-ripe ones, may need to try something like this next time! Definitely in the moment is the way to be! And these scones make me so wish to be in that moment! these look perfect! I love banana bread! dough seemed very wet ! I agree with Lorraine, the dough was very wet compared to typical scone dough. I also would STRONGLY recommend parchment paper over wax paper, I spent 20 minutes peeling paper off the bottoms. All in all, a tasty recipe, the glaze saves it. These turned out great and I haven’t iced them yet. Yum! So good! I did add a handful of chocolate chips but, other than that, I made the recipe exactly as written.